Pretty Real Flowers ~ They die. I sad. Pretty Wrapping Paper ~ They tear. I sad. I saw this carry case in Woodland Adventure Carry Case at Paperchase (a fun stationery store in UK) many weeks ago, and instantly fell in love with it! But I was skeptical about buying it, because of travelling issues and all. A couple weeks later, I thought: Whatever, I must have it. I went there and saw it's not in the same place it was the last time. I looked and looked around the store, and I found it hiding at the back of one table. Only one of its kind (there were about 5 last time), and I didn't feel good about it. Don't we all like to pick the best piece and usually assume the last one is probably defective? I asked the store assistant if they had another one. She: "You want to buy 2 of them?" Me: "No. Actually, there's a scratch on this one. Look. ", I pointed to an almost undetectable silver hairline scratch on the box. Yes, it was quite a moo point, and I would've bought it if I had no other choice. She: "Okay, I'll go check in the back for you, but we may be out of them." She came back in 5 mins with the only one left in stock. It was wrapped nicely in transparent plastic bag which was twisted into a ruffle at the end (like a sack) and tied with a golden plastic ribbon. Brand new, unopened, untouched. I had to stop myself from jumping and clapping, and delightfully squealing "Ooh, me likey!" Lipsticks: Rimmel Moisture Renew As You Want Victoria, Bourjois Shine Edition #20 1,2,3 Soleil (swatch here), Max Factore Elixir #825 Pink Brandy. The Body Shop Loofah, Vitamin E Body Butter, Wild Rose Hand Cream, Mango Shower Gel. Concealer- Maybelline Fit Me Concealer #20 Sand. Jewelry ~ Claire's bracelets, Accesorize Bow Necklace (more pics here), Pearl necklace. If you're wondering what this is, it's a Vintage Sticky Notes Book. I just couldn't resist the cuteness! Will just list the prices of some stuff ~ The carry case was for £6 | Rs.604 & Vintage Sticky Notes for £4.50 | Rs.453. The Body Shop products I recently got online at 50% Off. Hope you enjoyed this post & had a great weekend. I'm sorry for not posting much last week. I was gonna post on Saturday, but I fell sick. I disconnected myself from the online world, and didn't even turn on my computer. Now I'm fine, and have a lot of posts lined up before Christmas. 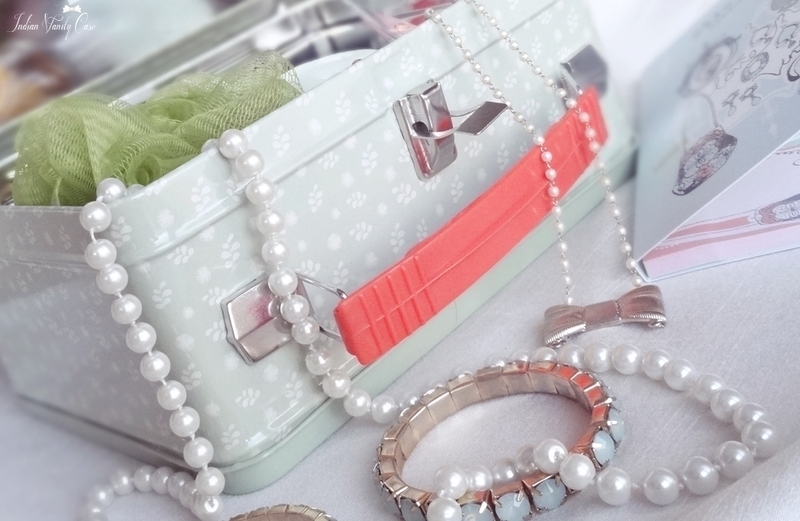 So, what items would you want to see when you open your 'Whimsical' carry case present? Would love to know! A sweater and tiara sounds perfect. Or maybe some beautiful accessories. It's adorable! how do u even find these things...just as in some Wonderland ! I love the sticky notes. LOVE. Love that vintage looking container! 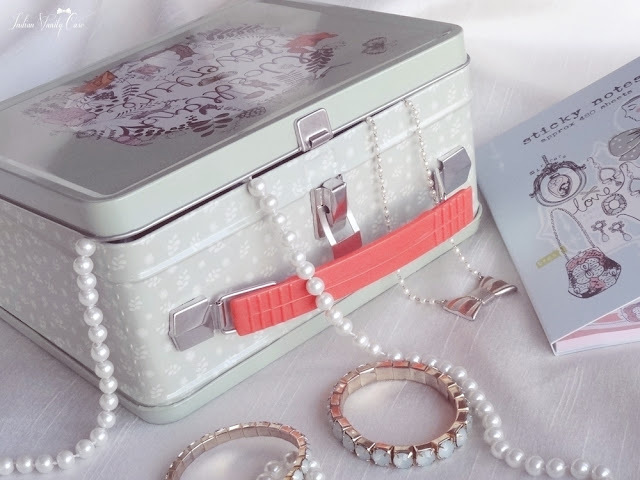 i want the box too, its lovely indeed.